Balicasag Island is one of the most popular scuba daytrips from visitors of Alona Beach, Panglao Island. 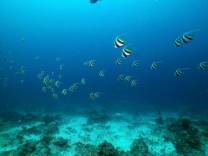 At four km southwest of Duljo Point, Pangalo Reef, Panglao Island you can find the 25 hectare large Balicasag Island. Besides one resort, restaurant and diveshop there is not much you can find on this flat island. It can be reached by boat after more than half an hour by banca from Alona Beach, Panglao Island. Balicasag Island is a marine sanctuary and fringed by a narrow ten to fifty meter wide reef with a steep shelf offering excellent hard corals, sponges and gorgonians. Its crystal blue waters are excellent for scuba diving and snorkeling while its white beach amazes all that visit them. Cabilao Island, the dream destination not only for divers but for avid snorklers as well. Scuba divers and Snorkelers are enthusiastic about the variety of the reef. The island is almost completely surrounded by an intact coral reef with diversified marine creatures. If you look for quiet and diversion, then is Cabilao, LA ESTRELLA BEACH RESORT the right place for you. The latest resort on famous Alona Beach, offers you 11 rooms, all fully equipped with aircon, twin or king size bed, private toilet & bath, hot & cold shower, cable TV, Mini-Bar, personal safety deposit box, restaurant, night time security guard, WiFi. Enjoy your meals in our cozy restaurant or sit directly on the white sandy beach, having your breakfast, lunch or dinner, a snack or a drink, with a wide selection of both local and international dishes. Hayahay Resort is the ideal resort for divers in the ideal location for divers. Arrange your diving holidays with Genesis Divers and join their daily dive trips to places like Balicasag, Pamilacan or Cabilao Island. Hayahay Resort and Genesis Divers are under german/philippino management. See you at Hayahay Resort!